Bone Bruise - What is a Bruised Bone? Causes, Symptoms and Treatments. Can you bruise a bone? Well, the answer is “yes.” If you play sports, have an accident or constantly twist and/or rotate your bones and joints, then there is a good chance that you will experience a bone bruise at some point in time. Although bone bruises are internal, they can be quite uncomfortable. This article will help you understand what a bone bruise is, the symptoms, the causes and how it can be treated. A bone bruise, also referred to as a bone contusion, typically occurs when the bone or the surrounding tissues, blood vessels and/or ligaments is injured or damaged. The trauma causes the bone to experience tiny fractures (breaks) that are often too small to detect on an X-ray. A bone bruise can occur in any part of the body that contains bones (such as the arms, neck, legs, etc.) and it can be quite painful. This type of internal bruise occurs as a result of a blow to the affected area, a sports-related accident and/or medical condition. This type of bone injury is often found in athletes who participate in martial arts, where it is normal to block an incoming attack with the use of your arms and legs. It also occurs when a sudden blow causes the bones to hit against each other. Most of the time a bone bruise will heal without medical intervention, but it is important to note that swelling and stiffness can occur during and after the bruise heals. 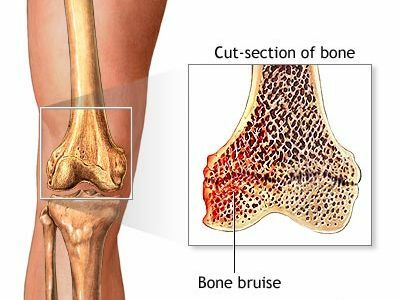 What are the types of Bone Bruises? Bone bruises can occur within and outside of the bone marrow. They can also involve the joints, ligaments and the surrounding blood vessels and tissues. The most common types of bone bruises are: intramuscular bruises, subcutaneous bruises and periosteal bruises. An intramuscular bruise, also known as interosseous bruising or bleeding, occurs when the bone marrow is compressed and internal bleeding occurs inside of the bone. Activities and sports (basketball, track and football) that require repetition, direct contact and intensity are usually the culprits of these types of bruised bones. When the bone marrow is damaged, it has difficulty regulating blood flow in that area, which causes internal bleeding. Once internal bleeding occurs the bone experiences an increase in bone pressure, which can lead to edema (swelling), pain and possibly bone death. Many times, this type of bone bruise occurs in the ankles and knees because these areas hold the most weight and experience the most pressure. A subcutaneous bruise, also known as a subchondral lesion, is a bone injury that occurs beneath a joint’s cartilage layer. This type of bone bruise arises when the surface of the cartilage is damaged causing it to separate from the bone. Subcutaneous bone bruises are caused by extreme compression (from running on hard surfaces or jumping), repetitive rotation and/or blunt force. It is important to note that the cartilage that covers the joints is very elastic, which makes it vulnerable to trauma, injury and/or damage. When the bones become compressed, the cartilage separates from the bone and internal bleeding occurs. Bruised bones, caused by repetitive rotation, are usually sustained from either sharply twisting the bone or repetitively sliding a joint (often a knee joint) backwards and forwards. When the joint bones repeatedly rotate it strips away the cartilage tissues and significantly exposes the bone. In some instances, a little portion of the bone may also be torn away with the cartilage. A periosteal bruise, also known as a sub-periosteal hematoma, occurs when the blood vessels surrounding the bone are damaged and/or injured and blood accumulates beneath the periosteum, a dense, tough membrane. The periosteum not only nourishes the bones, but also protects them from injury. This membrane contains a large quantity of blood so when a bone is injured and/or damaged it causes internal bleeding between the bone and the membrane. Older individuals are more likely to experience this type of bone bruise because their bones and blood vessels weaken with age. In some cases, the accumulation of blood in the little space between the bone and periosteum membrane causes a small painful lump to form in the affected area. This type of bruised bone is the most painful of all of the bone bruises. What symptoms are associated with a Bone Bruise? A bone bruise is not only painful; it may also contribute to the development of osteoarthritis. The following symptoms are linked to bone bruises: edema (swelling), pain and/or bone damage. Edema (Swelling) – A common symptom associated with a bone bruise is edema (swelling) in the injured area. Edema also causes the surrounding tissue and skin to become discolored and inflamed, which can then lead to a bruised bone. In other words, when the body tries to repair a damaged or injured bone, it sends blood to the affected area. The increased blood supply causes the blood vessels in the affected area to leak, which then leads to excess fluid and edema (swelling). In addition, when a bone bruise is near a joint, blood can leak into that joint, causing inflammation and swelling. Tenderness – Another common symptom linked to a bone bruise is tenderness. Tenderness from a bone bruise may take several months (depending on the severity and location of the injury) to heal. It is important to note that although the tissue and skin surrounding the bone bruise may be extremely sore during the first few weeks, the most severe pain will occur when pressure is applied to the affected area. In addition, individuals that have bone bruises on weight-supporting bones may have problems moving the injured area and/or putting weight on that part of the body. Furthermore, individuals who suffer from bone bruises on their thigh bones may have a hard time running and/or walking, while bone bruises to the shoulders, arms and/or wrists may restrict upper body movement. Bone Damage – A bone bruise can cause bone damage, in some cases. Bone damage, caused by a bone bruise, occurs when bone fibers break. These breaks are often too small to be detected on an X-ray, but they can be seen on a magnetic resonance imaging device (MRI). In fact, an MRI can show inflammation indicated by a decrease of water in the bone marrow. This type of bone damage can increase an individual’s risk of developing osteoarthritis later in life. There are a variety of reasons why a bone may become bruised such as: accidents, repeated twisting and sporting injuries. Accidents – A bone bruise can occur as a result of an accident. For instance, the direct impact from a car accident can jar the body and break, wound and/or bruise bones. Moreover, a bruised bone can also occur following a fall on a hard surface (falling down on concrete and/or ice). The higher the fall, the more likely the bone bruise. Repetitive Twisting – Repeatedly twisting a bone and/or joint can cause a bone bruise. Bruising occurs when repetitive twisting motions cause the injured joint bones to forcefully crash or bump against one another. The most common areas to receive a bone bruise from repetitive twisting are: ankles and knees. Sporting Injuries – A sporting injury can cause a bruised bone. A bone bruise, sometimes referred to as a contusion or hematoma, is a common sports injury. Sports-related bone bruises occur when the body makes direct contact with a hard surface such as: colliding with athletic gear and/or falling on the gymnasium floor. The ribs receive the most sports-related bone bruises. Ribs bones are bruised when they receive a strong hit to the upper part of the body. To avoid bone bruises, athletes should wear protective gear (helmets, chest protectors and shin guards). How are Bruised Bones treated? A bone bruise treatment may consist of the following methods: ice therapy, elevation, medication and/or rest. Ice Therapy – An effective way to treat a bone bruise is to apply a pack of frozen vegetables or an ice pack to the injured bone. Ice therapy can ease the pain and reduce the inflammation in the affected area. Apply ice to the injured bone for 15 to 20 minute intervals, several times a day. Make sure to place a towel or washcloth over the affected area before you place the ice on it. Placing ice directly on the skin can cause frostbite. Elevation – Another beneficial bone bruise treatment is elevation. The first step when treating a bone bruise is to raise the affected area above the heart. This step prevents and/or limits fluid accumulation in the affected area, therefore reducing the risk of a bone bruise. Once the fluid has been restricted or reduced, the body is more efficiently able to repair the injured bone. It is important to elevate the affected area (injured bone) for 15 to 20 minutes, several times a day. Rest – One of the easiest and most effective ways to help a bone bruise heal is to rest it. Staying off the injured bone can help it heal. Walking and/or moving the damaged bone not only causes extra stress and pressure in the affected area, it also delays the healing process. In fact, excess stress and pressure can cause the blood vessels in the affected area to break, leading to blood accumulation, pain and/or bone damage. A physician may suggest the use of an assistive walking device such as: a walker, cane or crutches until the bone properly heals. Physical activity should also be limited or restricted while the bruised bone is trying to heal. Medication – Bone bruises can be treated with medications when natural remedies do not work. Medications like topical pain-relieving creams and gels and over-the-counter pain- relieving medications like Tylenol, Bayer and Excedrin have the ability to ease pain, reduce inflammation and aid in the healing process. Many medications, especially non-steroidal anti-inflammatory drugs, can change the way the brain interprets and responds to inflammation and pain, therefore accelerating the healing process. Boden, B. P., Dean, G. S., Feagin, J. A., & Garrett, W. E. (2000). Mechanisms of anterior cruciate ligament injury. Orthopedics, 23(6), 573-578. Graf, B. K., Cook, D. A., De Smet, A. A. & Keene, J. S. (1993). 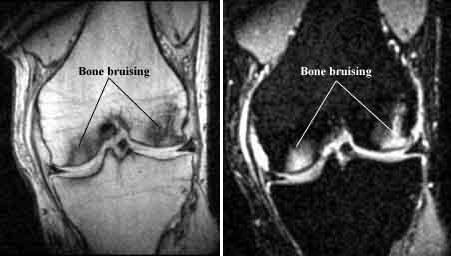 Bone bruises on magnetic resonance imaging evaluation of anterior cruciate ligament injuries. American Journal of Sports Medicine, 21(2), 220-223.